Elder tea counters cough and cold and as a natural remedy is recommended by traditional medicine. The soothing beverage helps in renal, hepatic, cardiovascular disorders, or inflammation of tonsils. Relieves pain and unpleasant problems caused by sciatica and rheumatism. This plant promotes stronger sweating and secretion of urine, phlegm and facilitates expectoration. It is often used with frequent respiratory infections, as it significantly accelerates the healing process. This plant is highly regarded today. Increasingly used is flavor syrup from its flower, and it is great for all family members. In addition to the tasty elderberry juice you can prepare many other medicinal preparations. One of them is the famous recipe for elder tea. Find out for what is good for and why it is so popular in our popular medicine. Everybody knows elder (elderberry) plant, whose Latin name is Sambucus nigra. It belongs to the oldest and most medicinal plants found all over Europe. It can be found in numerous forest clearings, forest edges, place roads and settlements. It thrives of light, moist and permeable ground. In old civilizations elder represented the symbol of death and birth, it was a protector from evil forces, and ally of witches. According to popular belief, its crown is inhabited by ghosts. In some parts of the world this is still regarded to be true. Wine of elderberries is considered a fairy drink, when you drink it, allegedly you acquire the power to see fairies and interact with them. By the end of the 19th century with the inevitable elder tea, on the streets of London you could buy aromatic elder wine. Most served during the cold winter days, that warmed and strengthened bystanders and workers. Elder is a deciduous shrub that grows 3 to 10 meters in height. Bark is thick and light gray, while the branches are hollow and woody, filled with a soft core. The leaves are bright green and plumose, egg-shaped and slightly pointed. The flowers are bipolar, fragrant, white and yellow. The elder plant blossoms from April to June. The fruits are initially green, then turn into purple-red, and finally are completely black. Berries are 3-6 mm in diameter with 3 seeds, which give red juice. They are really popular for syrup, or other glossy recipes. Elder as a medicine was used in the time of Hippocrates, Pliny and Galen. They claimed that this plant can replace all of the former medication. In the past, juice and tea were particularly prized whose curative effect is still present today. In ancient Rome women dyed hair with it, the juice of ripe berry gave a beautiful reddish glare. The whole elder tree was appreciated for practical and medicinal purposes for thousands of years. For soothing tea, as well as juice and syrup are used in all parts of the plant. The flowers, leaves, berries, bark and root which fully utilizes the medicinal properties of the plant. Elder plant delicious drinks are a real balm for sore throat, assist with the expectoration and speed up the healing process. In Bulgaria, it went a step further. The locals claim that the elderberry is a remedy for cancer, and treats the most dangerous diseases. The flower is harvested in June, while not in full bloom, during warm and dry days. It is dried carefully and suddenly, in thin layers, in the attic or using artificial heat. It should have the natural color. If by any chance turns black, then it is of no use and must be discarded. Preserving elder flowers is extremely important, for this purpose, use only containers that can be sealed. Who should drink elder tea? Hot tea is made with soaking of flowers. If drunk at the start of colds, flu, sore throats it promotes the healing effect. It will encourage blood flow, will enable faster sweat and thus eject the toxic substances. It can be given to children during eruptive diseases such as measles. It will cure hives in the short term and will improve recovery period of youngsters. 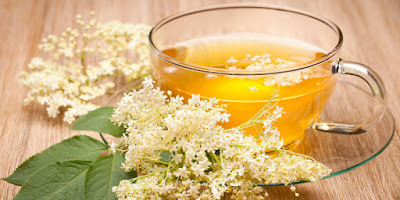 Elder flower also accelerates secretion of mucus and facilitates colds, catarrh, sinusitis and blockage of the bronchi. Tea made from elderberry works relaxing, relieves bronchial spasms and helps with asthma. Acts as a potent diuretic, eliminating toxic substances that accumulate in arthritis and gout. This drink is used for alleviating inflammation and treating ulcers of the skin, wounds and burns. With elder tea for this purpose applicable is lotion, as well as fat. The ingredients stimulate toxin release. Already in the spring the bark of elder is collected with thick branches. We use its middle, and green layer. Before using we need to scrape the foreskin and throw it away. It has almost the same value as the flower. It cures kidneys, heart and liver. From the root and bark you can make ointment against eczema and psoriasis. The leaves of elder plant are harvested only when fully developed. Fresh minced leaves are placed on painful areas and trimmed, they help with neuralgia of the face. Also they are very effective as wraps for external hemorrhoids. Fresh leaves of elder plant was once put on temples, in order to mitigate the unpleasant headaches. With them we can rub the face face in order to drive out the persistent insects. It is not recommended for people with sensitive skin, they can cause certain reactions. Tea prepared from leaves perfectly purifies the blood and is the best remedy against impure skin. A mild drink will help with gout, and is good with bad breath, because it successfully neutralizes it. Tea made from the leaves and bark of elderberry helps with irregular and hard stools, because it eliminates constipation in the short term. In addition, it is given to persons who cannot hold urine. Tablespoon of dried berries dip for 12 hours in a cup of cold water. Then drink heated before breakfast. The berries are harvested at the end of the year, when fully matured. They contain a lot of vitamin C and other valuable nutrients. Be sure to dry them, and you can make a juice (syrup), jam and marmalade using the same berries. Folk medicine offers us a large number of recipes for making this miraculous beverage. Almost for every known ailment there is a solution in the form of elder beverage. 2 teaspoons of flowers pour over with 3 dl of boiling water. Keep it covered for ten minutes, then you need to strain and while still lukewarm drink it. It is dosed throughout the day in measured small sips. 7-8 leaves are poured with only half a pint of boiling water and is easy to cook for another 5 to 6 minutes. Then drink is strained and when it cools add a full scoop of homemade honey. In addition to cleaning the blood thus made tea from elderberry is good for rashes, liver, kidneys and lungs. With that we enable the faster discharge and will calm the nervous stomach and intestines. What many ladies are especially interested in is certainly tea for weight loss from elder root. This drink is effective but not "miraculous". It can contribute to faster digestion of food and acceleration of the metabolism, but you certainly need to correct the nutrition. Additionally daily physical activity is recommended, because kilograms you will not go away by themselves. How to make this beverage that melts kilograms? One tablespoon of finely chopped root cook in a cup of water or wine for 20 minutes. Strain and drink during the day. The resulting quantity is sufficient for the whole day. Drink elder tea for weight loss slowly and follow all other recommendations. Between thick crust and central part of the tree, there is a light green jacket. It is used for preparing tea which successfully cleans the stomach of all the harmful acid. 2 teaspoons of light green mass pour with 2.5 dl of boiling water. After 10 minutes strain the beverage. Drink slowly in sips to mitigate gastric interference. Berries are covered with water, add sugar and a short boil. When the mixture cools pour it into a larger pot and sprinkle the top with crumbled yeast. The jar should be covered with clean linen cloth and leave it for a longer period until they ferment. After 4 to 5 weeks elder berries will sink to the bottom of the jar, which is an indication that the fermentation is completed. Liquid, carefully pry up and pour into a clean bottle. The wine cooked with berries helps with dropsy. If you have a burning sensation in the eyes, mix fresh leaves with egg whites. This mixture gently put on closed eyelids. It will remove unpleasant symptoms in the short term. 100 grams of flowers put in a linen bag and keep in the bathtub with water for 30 minutes. The so prepared bath, swim ten minutes. This treatment will help in almost all of the above diseases. With the inevitable elder tea that is proven as a cure for many ills, recommended is another great recipe. 15 grams of fresh flowers of elderberry put in 5 dl of apple vinegar and leave in a warm place for two weeks. Then strain and take a tablespoons per day, together with water. Thus prepared Elder vinegar will mitigate existing rheumatic ailments and other ailments. 40 large flowers cover with 4 l of cold water and let it stand for a whole day (24 hours). Then strain and in the liquid, add 4 kg of sugar and 4 bags of limuntos. Feel free to add them juice of 4 lemons. During the next 24 hours, elder syrup is occasionally mixed and then poured in a bottle. This vitamin elder syrup is diluted with water, and children love it. Prepare 5 kg of elderberries, 2 kg of sugar, and a liter of water, a preservative and lemon crust. Optionally add 5 to 10 cloves. First, take the berries from the stems, wash and put in court with thick bottom. Finally pour over water. Cook syrup very slowly, over low heat until it boils. Then remove to the side and add the sugar, lemon rind (cut into thin slices) and cloves. Then go back to cooking, and put it again to boil. After ten minutes remove it, add preservatives and pour in bottles. At the very end with the popular juice, syrup and tea we have prepared another remarkable recipe. It is a real delicacy and that is jam with berries. 2 kg of berries need to be mashed. Cook them in a little water with the inevitable addition of 500 grams of sugar. When most of the liquid evaporates, pour the mixture into jars. Jam is very tasty and healthy, everybody can use it. Be sure to give it to your children, for sure they will like it. In the spring, the elder flower can be used against pollen allergy. If you have the above mentioned problems consult your doctor before applying any prescriptions. The fresh plant is poisonous and should not be consumed without cooking. Elder tea in pregnancy is not allowed and is not recommended to nursing mothers. At the very end, we recommend that you read how to make elder plant juice without added preservatives.